Click on the picture above for a larger view! Safety Boots Standard – How safe is Your Boot? Ever heard of the safety boots standard? Like many other people, your likely answer is “NO.” Chances are you were attracted to the footwear because it claimed to offer the best safety, is common with other workers, or you needed to upgrade to a better type. You probably didn’t spend time looking at it, the design, the markings, signs or label. While these may look like basic or unimportant issues, they will determine how safe you will be while at the site. Yes, the boot will be well-built and features a heavy-duty sole for firm-grip even in wet and oily surfaces; however, it won’t protect you from electricity shock. A boot will resist electrical currents but won’t withstand sharp spikes, rugged edges or heavy debris. You can know whether your work boots suited for the task at hand by looking at the signs, markings and label found on the footwear. – Orange Omega Safety Sign: This sign indicates that the boot meets the minimal standards in regard to electrical charges. It will come with a sole that is resistant to electrical and static charges and will protect your feet / body from shock or electrocution. – Green Triangle: This shows the boot consists of a grade 1 sole and class 1 toe cap. The sturdy-sole is tolerant to punctures, rugged edges, sharp points, prolonged impact not exceeding 125 joules, and heavy falling object. The toe cap will protect the toes against impact from hitting obstacles or falling debris. It is less-susceptible to wear & tear compared to other classes and is designed for workers in heavy industries and construction. – Yellow Triangle: Boots featuring this marking come with a grade 2 sole and class 2 toe cap. Just like the green triangle, this boot’s sole is resistant to punctures and protects the toes and feet from impact not exceeding 90 joules. Nonetheless, they are not as sturdy or heavy-duty as boots with the Green Triangle and are best suited for light industries. – Blue Square: This indicates the boot comes with a grade 1 toe cap for protecting the user’s toes and feet from impact of up to 125 joules. However, the sole is not puncture-resistant and may be punctured by sharp objects, sharp edges, or rugged terrains. – Yellow Square plus Greed SD Letters: The boot is approved for use in areas that experience electrostatic charges. The anti-static sole not only protects the wearer from electrical charges but also safely dissipates static. – Grey Background Bearing Black Letter R in a Circle: The shoe features a grade 2 toe protection that can withstand impacts up to 90 joules. It however doesn’t come with a puncture-resistant sole and is therefore fit for non-industrial work. – Red Square with Grounding Symbol and Black-colored Letter C: This boot is fit for environments with low electrical charges. It features an electrically-conductive sole for absorbing mild charges. Unfortunately, it is not deigned for areas with high electrical charges. 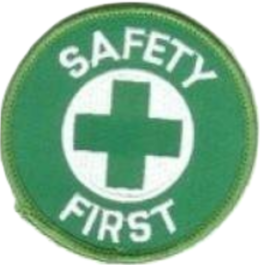 – White Background with Green Fir Tree: The green fir depicts the forest hence is suitable for wearing in forested areas. The boot is ideal for people using cutting equipment such as chainsaws in the forest or working on lumber. It will protect your feet from splinters, needles/pricks, sharp leaves and other falling and flying debris. There you go- common signs and markings that depict how safe and suitable your safety boot is. Before investing in any product, you need to first match the boot to the need at hand. 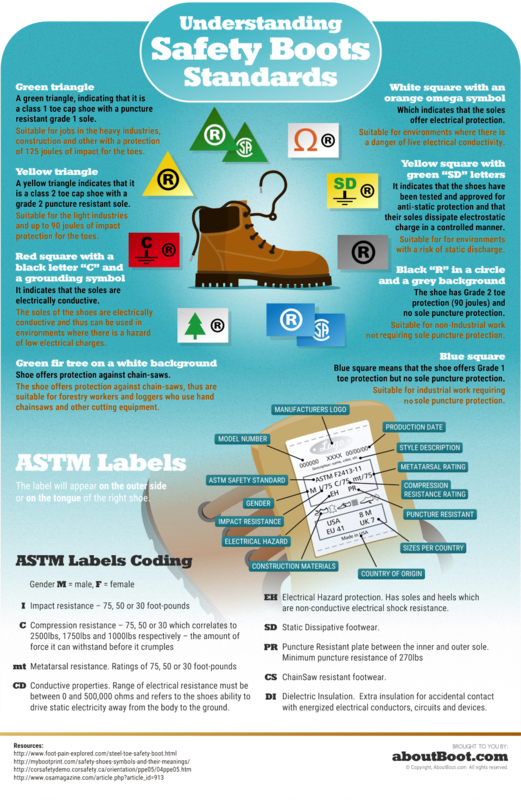 Check out this beautiful infograph to learn more about safety boots standards and related issues.